LOS ANGELES -- Tomorrowland was originally going to be called World of Tomorrow. Frontierland was Frontier Country. Lilliputian Land never became a reality at Disneyland. And no one could have foreseen a "Star Wars" land opening in 2019. Walt Disney spent a marathon weekend in 1953 brainstorming ideas for the new family amusement park he envisioned called Disneyland. There would be a train station and an old-fashioned Main Street square. The park would have a princess castle and a pirate ship, maybe even a rocket. 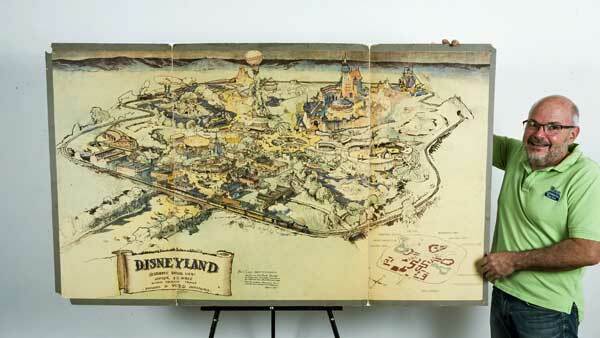 Disney wanted to get investors on board, so he described the various elements he imagined to artist Herb Ryman, who translated them into a hand-drawn map - Disneyland's first. That original concept art could fetch as much as $1 million when it goes up for auction next month, auctioneer Mike Van Eaton said. Collector Ron Clark knew the map was special when he acquired it 40 years ago from a former Disney employee who'd been friends with Walt Disney. Clark says he felt a "spirit of presence" as soon as he saw the 3 -foot by 5 -foot ink and pencil drawing on paper affixed to a tri-fold poster board like a science fair display. "It had this aura," he recalled. "It just kind of puts you in awe that this is the piece that came out of Walt Disney's mind and this is what came about: this park, these parks worldwide, the passion people have for it today and the happiness of hundreds of millions who have graced these lands." Clark started collecting Disney items in the 1960s. He saw a small silver spoon in a Disneyland souvenir shop and plunked down $10 for it. When he later saw that same spoon show up as a collectors' item in a Disney fan magazine, he was hooked. "I have an affection for the man and what he created. It's just brought us and our family such joy," said Clark, who still holds an annual pass to Disneyland and makes it out to Southern California from Utah at least three times a year to visit the park. "All 20 of our grandbabies are Disney-fied," he said. Clark's collection focuses on the dawn of Disney. The earliest piece is an Ingersoll watch from 1928 and the most spectacular is the map. But with his 70th birthday approaching, Clark wanted to see about finding a more permanent home for his prized piece of memorabilia. "It was always my desire to somehow return it to Disney," he said. "I wanted it to go home. For 40 years, that has been my wish." Disneyland spokesman John McClintock wouldn't say if park officials will be among the bidders when the map goes up for auction June 25. He was familiar with the piece, though, calling it "a very speculative drawing." "It was drawn to make people think this is going to be a great park," he said. Walt Disney Parks and Resorts still produce concept art for new park features. The company released a full-color image last year of the proposed "Star Wars" land, complete with an X-wing fighter flying overhead. The 14-acre "Star Wars" expansion represents the biggest ever at Disneyland, McClintock said, though the park has been evolving almost since it opened in 1955. The Matterhorn Bobsleds and the Monorail were added in 1959. The Enchanted Tiki Room opened in 1963. The Small World ride came in 1966, followed by Pirates of the Caribbean in 1967. The official Disneyland Hotel opened in 1988. A whole new park, Disney California Adventure, and accompanying Grand Californian Hotel were added in 2001. None of those elements were part of Ryman's 1953 sketch. It's hard to compare concepts from that original map with what actually exists in the park today, McClintock said. "It predates any work on Disneyland and it doesn't really resemble Disneyland, so you can't really use that as a template for how the park developed," he said, noting that the famous Sleeping Beauty Castle that sits in the center of the park is shown much further back in the concept sketch. Other elements though, including the train station and Main Street square, look the same on the map as they do at the park in Anaheim, California. "The story behind the art is that it was all done in a weekend," McClintock said. "It's amazing that they got as much right as they did." For the auctioneer, whose Van Eaton Galleries are full of Disney animation cells, old park souvenirs and even the googly-eyed sea monster from the now-shuttered Submarine Voyage ride, the pre-Disneyland map is "the ultimate." After spending the past four decades locked away in a vault, the map will be on view for the public at the gallery in the weeks leading up to the auction. "There's never been anything like it," said Van Eaton.